Ames Stereo Pipeline’s (ASP) current integer correlator leaves a bit to be desired. Currently it does poorly in scenes with aggressively changing slopes. It is also a coin flip if it finishes in an hour or several days. So I’ve been working on researching a new correlator by reading, implementing, and applying to satellite imagery a select few of the top performers from the Middlebury stereo competition. I started this a long time ago with PatchMatch and I never gave a good conclusion. Now I will summarize by experiences and give a short introduction into the current solution I’m pursuing. Semi Global Matching:  This is a world recognized well performing stereo algorithm. I don’t need to say its graces. The cons in my opinion are that it uses a lot of memory and that it is only applicable to 1-D searching. For ASP we like to have 2-D searching solution, or optical flow, to handle flaws in the user’s input data and because some users have actual used us for the creation of velocity maps. We might have been to get around the inaccuracies in our users data and the horrors of linescan cameras by calculating a local epipolar vector for each pixel after a bundle adjustment. But I believe we wouldn’t catch the vertical CCD shifts and jitter seen in HiRISE and World View satellites. As for the memory problem, there have been derivative SGM algorithms to fix this problem, but I didn’t evaluate them. PatchMatch:  I really love the idea of starting with a uniform noise guess for the disparity and then propagating lowest cost scores to the neighbors. There were a couple downsides to this algorithm for satellite processing. 1. The cost metric of absolute differencing intensities and gradients performed much worse than an NCC cost metric in the arctic. 2. The run time was horrible because each pixel evaluation didn’t reuse previous comparison used by neighboring pixels. 3. Their slanted window needed to be adapted to support slants in the vertical direction as well as the horizontal for our optical flow demands. I couldn’t find a formulation that would stop the algorithm from cheating by defining the window as 90 degrees from the image geometry. In other words, the PatchMatch algorithm kept finding out that the correlation score was minimal if you define the kernel as having no area. Despite all of this, a plain jane implementation of PatchMatch using NCC and non-slanted windows performs the same as a brute force dense evaluation of a template window across all disparity values. This also means that places were brute force search fails, so would PatchMatch. But, maybe for extremely large search ranges, PatchMatch might be worth its processing time. I will keep this in the back of mind forever. PatchMatch with Huber Regularization:  This is a neat idea that is built on top of Steinbruecker and Thomas Pock’s “Large Displacement Optical Flow Computation without Warping” . (Seriously though, Thomas Pock hit a gold mine with lets apply a regularity term to everything in computer vision and show an improvement.) I eventually learned how to implement primal dual convex optimization using Handa’s guide . I realize now that everything I need to know is in Heise’s paper , but it took me a long time to understand that. But I never implement exactly what the paper described. They wanted a smoothness constraint applied to both the disparity and the normal vector used to define the correlation kernel. Since I couldn’t define a slanted correlation kernel that worked both in horizontal and vertical directions as seen in PatchMatch, I just dropped this feature. Meaning I only implemented a smoothness constraint with the disparity. Implementing this becomes a parameter tuning hell. I could sometimes get this algorithm to produce a reasonable looking disparity. But if I ran it for a few more iterations, it would then proceed to turn slopes into constant disparity values until it hit a color gradient in the input image. So it became a very difficult question for me of, at what point in the iterations do I get a good result? How do I know if this pretty result is actually a valid measurement and not something the smoothness constraint glued together because it managed to out weight the correlation metric? In the image I provided above, you can see a slight clustering or stair-casing of the disparity as the smoothness constraint wants disparity values to match their neighbors. Also, random noise spikes would appear and neither the total variance (TV) term or the data term would remove them. They are stable minimas. I wonder if a TVL1 smoothnss term would be better than a TVHuber. As Rigid As Possible Stereo under Second Order Smoothness Priors:  This paper again repeats the idea seen in PatchMatch Huber regularization of having a data term, a regularization term, and theta that with increasing iterations forces the two terms to converge. What I thought was interesting here was their data term. Instead of matching templates between the images for each pixel, instead break the image into quadratic surfaces and then refine the quadratic surfaces. This is incredibly fast evaluating even when using a derivative free Nelder Mead simplex algorithm. Like several orders of magnitude faster. Unfortunately this algorithm has several cons again. 1. They wanted to use the cost metric seen in PatchMatch that again doesn’t work for the satellite imagery of the arctic that I have been evaluating. 2. The data term is incredibly sensitive to its initial seed. If you can’t find a surface that is close to the correct result, the Nelder Mead algorithm will walk away. 3. This algorithm with a smoothness prior is again a parameter tuning hell. I’m not sure that what I tune up for my images will work equally well for the planetary scientists as well as the polar scientists. Fast Cost-Volume Filtering for Visual Correspondence and Beyond:  This is an improvement algorithm to the KAIST paper about Adaptive Support Weights. (Hooray KAIST! Send us more of your grad students.) They say hey, this is actually a bilateral filter that Yoon is talking about. They also recently read a paper about performing a fast approximate of the bilateral filter by using a ‘guided’ filter. In the end this is similar to a brute force search except now there is fancy per pixel weighting for each kernel based on image color. This algorithm is easy to implement but fails to scale to larger search regions just like brute force search. Yes this can be applied in a pyramidal fashion but I think in the next section that I’ve hit on a better algorithm. I wouldn’t count this algorithm out all together though. I think it has benefit as a refinement algorithm to the disparity, specifically in cases of urban environments with hard disparity transitions. What am I pursuing now? Our users have long known that they could get better results in ASP by first map projecting their input imagery on a prior DEM source like SRTM or MOLA. This reduces the search range. But it also warps the input imagery so that from the perspective of the correlator, the imagery doesn’t have slopes anymore. The downside is that this requires a lot of work on the behalf of the user. They must run a bunch more commands and must also find a prior elevation source. This prior elevation source may or may not correctly register with their new satellite imagery. My coworker Oleg hit upon an idea of instead using a lower resolution disparity, smoothing it, and then using that disparity to warp the right image to the left before running the final correlation. It’s like map projecting, except with out the maps, camera models, and prior existing elevation source. I’ve been playing with it and made a pyramidal version of this idea. Each layer of the pyramid takes the previous disparity, smooths it, and the warps the right image to the left. Here is an example of a disparity produced with this method up against current ASP correlator’s result. I have single thread rough prototype variant and an in-progress parallel variant I’m working on. Looks pretty good right? There are some blemishes still that I hope to correct. Surprisingly the parallel implementation of this iterated warping correlator is 2x faster than our current pyramid correlator. Another surprising feature is that the runtime for this mapping algorithm is mostly constant despite the image content. For consecutive pyramid levels, we’ll always be searching a fixed square region, whereas the original ASP pyramid correlator will need to continually adapt to terrain it sees. Once I finish tuning this new algorithm I’ll write another post on exactly why this is the case. 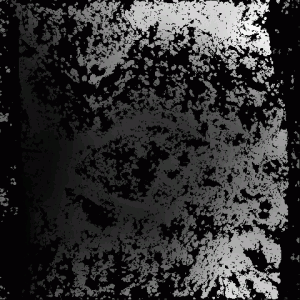 There is also a bit of a black art for smoothing the disparity that is used for remapping the right image. I’m pretty excited again about finding a better correlator for ASP. I still have concerns about how this iterative mapping algorithm will handle occlusions. I also found out that our idea is not completely new. My friend Randy Sargent has been peddling this idea for a while . 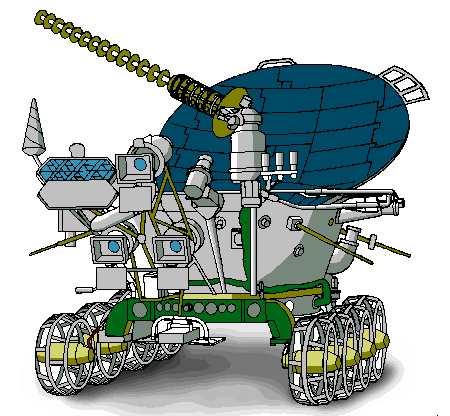 He even implemented it for the Microscopic Imager (MI) on board the Mars Exploration Rovers. I didn’t even know that software existed! But they used homography matrices, while our ‘new’ idea is using a continuous function. In the end, I hope some of you find my diving into stereo research papers useful. I learned about a lot of cool ideas. Unfortunately very few of them scale to satellite imagery. Hirschmuller, Heiko. “Accurate and efficient stereo processing by semi-global matching and mutual information.” Computer Vision and Pattern Recognition, 2005. CVPR 2005. IEEE Computer Society Conference on. Vol. 2. IEEE, 2005. Bleyer, Michael, Christoph Rhemann, and Carsten Rother. “PatchMatch Stereo-Stereo Matching with Slanted Support Windows.” BMVC. Vol. 11. 2011. Heise, Philipp, et al. “PM-Huber: PatchMatch with Huber Regularization for Stereo Matching.” Computer Vision (ICCV), 2013 IEEE International Conference on. IEEE, 2013. Steinbrucker, Frank, Thomas Pock, and Daniel Cremers. “Large displacement optical flow computation withoutwarping.” Computer Vision, 2009 IEEE 12th International Conference on. IEEE, 2009. Handa, Ankur, et al. Applications of Legendre-Fenchel transformation to computer vision problems. Vol. 45. Tech. Rep. DTR11-7, Department of Computing at Imperial College London, 2011. Zhang, Chi, et al. “As-Rigid-As-Possible Stereo under Second Order Smoothness Priors.” Computer Vision–ECCV 2014. Springer International Publishing, 2014. 112-126. Rhemann, Christoph, et al. “Fast cost-volume filtering for visual correspondence and beyond.” Computer Vision and Pattern Recognition (CVPR), 2011 IEEE Conference on. IEEE, 2011. Yoon, Kuk-Jin, and In So Kweon. “Adaptive support-weight approach for correspondence search.” IEEE Transactions on Pattern Analysis and Machine Intelligence 28.4 (2006): 650-656. Sargent, Randy, et al. “The Ames MER microscopic imager toolkit.” Aerospace Conference, 2005 IEEE. IEEE, 2005. I really wanted to implement the Heise’s 2013 paper about Patch Match with Huber regularization . However that is a little too much for me to bite off, I kept getting lost in the derivation of the Huber-ROF model. So instead I chose to implement something in between Heise’s paper and Steinbrucker’s 2009 paper about large displacement optical flow . I shall call what I implemented the ghetto Patch Match with squared regularization. I’m fancy. The idea behind this implementation is that we want to minimize the following equation over the image omega. If this equation looks familiar, it’s because you’ve seen in Semi Global Matching and it is the basis for most all “global” matching ideas. An interesting technique that I think originates for Steinbrucker’s paper is the idea that solving this directly is impossible. However if we separate this equation into two problems with convex relaxation, we can solve both halves with independent algorithms. In the equation below, both U and V are the disparity image. When theta is large, U and V should be the same disparity image. Solving this new form of the equation is done with theta close to zero. Each iteration U is solved with a fixed V. Then V is solved with a fixed U. Finally in preparation for the next iteration, theta is incremented. After many iterations, it is hoped that U and V then converge on the same disparity image. The algorithm I’ve implemented for this blog post is considerably different from Heise’s paper. I’ve parameterized my disparity with an x and y offset. This is different from Heise’s x offset and normal vector x and y measurement. I also used a sum of absolute differences while Heise used adaptive support weights. Heise’s method also used a Huber cost metric on the smoothing term while I use nothing but squared error. This all means that my implementation is much closer to Steinbrucker’s optical flow algorithm. Here is a result I got with cones using a 3×3 kernel size. That 3×3 kernel size should impress you. I can greatly drop the kernel size when there is a smoothness constraint. However images of cones and perspective shots in general are not what I care about, I care about the application of this algorithm to terrain. Here it is applied to a subsampled image of a glacier imaged by World View 2. Crap! Instead of converging to some actual disparity value, it just blurred the initial result. Possibly this didn’t work because I didn’t tune parameters correctly. With all global matching algorithms there a bunch of lambdas that try to bend the two cost metrics to equal footing. But is this really the answer? I think it has something to do with the fact that Patch Match produces the same result as brute force search result, a.k.a. the global minimum across all disparity values. If you look at the global minimum result for both of these input images shown below, you’ll see that the World View imagery is exceptionally ill conditioned. It seems that the smoothness constraint isn’t strong enough to over come the initial global minimum from correlation. Despite the noise, in the ‘cones’ example it is clear there is just high frequency noise around the final disparity image that we want. However with the World View example, there is no such clear view. That disparity image should be a simple gradient along the horizontal. ASP’s take on this region is shown right. 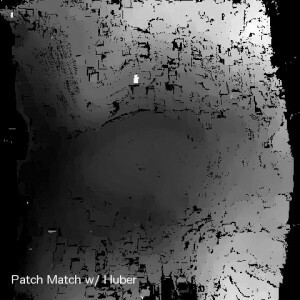 However since the texture is self-similar across the image, this creates patches of global minimum that are the incorrect and resemble palette knife marks. Seeding the input correlation result with ASP’s rough solution helps things to some degree. But ultimately it seems that this convex relaxation trick doesn’t insure that we converge on the correct (and what I hope is the global) minimum from the original equation. Another detail that I learned is that if Patch Match is going to converge, it will happen in the first 10 iterations. My conclusion is that having a mostly globally minimum cost metric is required. Unfortunately increasing kernel size doesn’t help much. What I think is worth investigating next is: (1) implement the affine matching and second derivative smoothing detailed in Heise’s paper; (2) Cop out and implement hierarchical Patch Match; (3) recant my sins and investigate fSGM. Eventually I’ll find something good for ASP. Rudin, Leonid I., Stanley Osher, and Emad Fatemi. “Nonlinear total variation based noise removal algorithms.” Physica D: Nonlinear Phenomena 60.1 (1992): 259-268. Chambolle, Antonin. “An algorithm for total variation minimization and applications.” Journal of Mathematical imaging and vision 20.1-2 (2004): 89-97.